How do you Pick your Followers? New Follower Tuesdays are always exciting. If you have an Inn, you get to chose an ability or trait, then pick one follower for the week from three choices. I’ve been picking only the Treasure trait for a while because – MORE GOLD – so other than that, which of the three to pick can be an agonizing decision. 1. Is it a Rare (blue) follower? Yes – save me some leveling. 2. Is it a Death Knight? Yes, just because they look awesome. 4. Is it a Female Panda? Yes, because they are as cute as a button. 5. And finally, most important of all – Do I like their outfit? Yes. Sometimes this will take priority over everything. I’ve picked up a follower wearing the same “Doomcaller” set as my Warlock’s transmog. 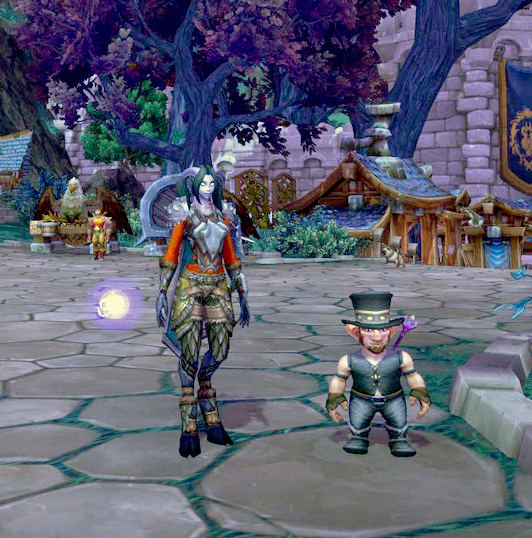 Last night I hit the jackpot – I got the Gnome in a Top Hat. Yeah, it was on my Shaman I don’t play very much, but what the heck. She seems to get all the good followers like Soulare of Andorhal and some DKs with smokin’ hot outfits. Maybe someday we’ll get account-wide followers and can just let the extras wander around our Garrisons instead of “deactivating” them. Ugh. I really hate deactivating followers. Which brings up the next problem – who to deactivate? My Warlock is just about full up on great outfits, cute Pandas and awesome DKs. That leaves some of the quest/achievement followers but no way I’m deactivating Croman or my Birdies. Come on Blizz – keep a 25-limit cap for the missions but for love of Elune don’t make us deactivate our friends! You won the Inn! I’m keeping my eye out for a top-hatted Gnome! So far no luck on any of my characters.